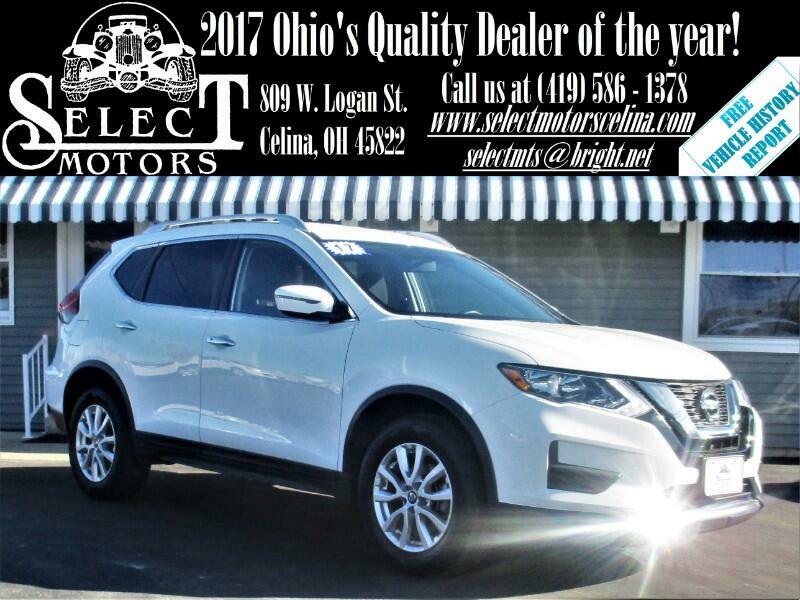 ***TXT US @: (419) 362 - 6200*** AWD, Backup camera, heated seats, blind spot monitors, keyless entry with remote start, automatic headlights, heated/signal mirrors, dual automatic climate control, power windows/locks/mirrors, AM/FM, SiriusXM, auxiliary and USB port, steering wheel mounted audio controls, Bluetooth, power seats with power lumbar, tilt and telescopic steering wheel, cruise control, information center, 17" alloy wheels. Warranties: Balance of Nissan's 3 year or 36,000 mile bumper to bumper and 5 year or 60,000 mile powertrain. In service date: 03/31/2017. Extended service contracts available. The 2017 Nissan Rogue is a five-passenger compact crossover SUV that is available in three main trim levels: S, SV and SL. Regular Rogues come standard with a 2.5-liter four-cylinder engine (170 horsepower, 175 pound-feet of torque) paired with a continuously variable transmission (CVT) that sends power to the front wheels. All-wheel drive is available as an option.The Nissan Rogue Hybrid is powered by a 2.0-liter four-cylinder along with an electric motor (176 hp combined output) and is offered in front- or all-wheel drive. It is only available in SL and SV trims. Standard feature highlights for the Rogue S include 17-inch steel wheels, cloth upholstery, sliding and reclining 40/20/40 split-folding rear seats, a clever cargo management system, a rearview camera, Bluetooth phone and streaming audio, a 5-inch infotainment display and a four-speaker CD player with USB input and satellite radio. The SV trim adds alloy wheels, roof rails, automatic headlights, heated mirrors, keyless entry and ignition, blind-spot monitoring with rear cross-traffic alert, remote ignition, dual-zone automatic climate control, heated front seats, a six-way power driver seat, a leather-wrapped steering wheel and gear selector, and a six-speaker audio system. The Midnight Edition, available on on the SV, adds blacked-out body pieces such as 17-inch wheels, mirror caps, black splash guards, rear bumper protector, and illuminated kick plates, as well as blacked-out roof rails and crossbars and Midnight Edition specific floor mats. The top-of-the-line SL trim includes 18-inch wheels, automatic high beams, foglights, a hands-free power liftgate, leather upholstery, a heated steering wheel, driver-seat memory functions, a universal garage door opener, a 7-inch touchscreen, a surround-view camera system, a navigation system, Siri Eyes Free iPhone control, Nissan Connect emergency and convenience telematics, and a nine-speaker Bose audio system.